Lately I have been enjoying cooking the most yummy kitchari for myself to heal and rebuilding my friendly flora inside and out. I am excited to share with you some of its healing benefits as well as my super yummy recipe. A porridge-like blend of beans and rice, kitchari is a traditional Indian comfort food that is healing for body, mind and spirit. In India, kitchari is often the first food for babies and has long been used to nourish babies and the elderly, the sick, and the healthy during special times of detox, cleansing, and deep spiritual practice-not only because it is so easy to digest, but because it also heals and soothes the intestinal wall. With 95 percent of the body’s serotonin produced in the gut, it is clear we process our stress through the intestinal wall. Chronic stress will irritate the intestinal wall and compromise digestion, the ability to detoxify through the gut, and cope with stress. During a kitchari cleanse, the digestive system can heal. While we offer four dietary options in our kitchari cleanses, eating just kitchari as a “mono diet” allows much of the digestion to be at rest during the cleanse, providing the nutrition needed to heal the gut and nourish the body. Having adequate protein to maintain blood sugar stability during a cleanse can facilitate feelings of inner peace and calm. The state of fat metabolism facilitates a deep inner calm, making it the natural state for spiritual inquiry and practice. For this reason, kitchari was also fed to monks and ascetics to help create a sense of stillness in which we gain greater access to old toxic emotional and behavior patterns. This is also why kitchari is the food of choice of Panchakarma, Ayurveda’s deepest detox retreat. Ayurveda is big on cleansing. Seasonal cleansing, to be specific. Fall and spring are seen as the prime times to cleanse. This makes sense to me because springtime often creates a dichotomous sensation in our bodies. On the one hand everything is waking up and coming alive around us. The earth is waking up and with that awakening there is an instinctive desire to follow suit. At the same time, we still feel sluggish, heavy, cold and withdrawn internally from winter. Many people (including me!) have trouble with fasting. My blood sugar plummets too low in the detox process and I find that austere fasting strains and depletes my blood sugar reserves. I often get so hungry, irritable, and end up with a low blood sugar headache or crash. The goal of a fast is to shift the body into fat metabolism and detox the fat cells, but this will not happen if the body is under stress and strain as a result of a difficult fast. While attempting to detox heavy metals, preservatives, chemicals, pesticides and environmental toxins from our systems and fat cells with a cleanse, we alspo have to make sure that we are not straining, or the amount of fat burned will be minimal. The goal of any effective cleanse should be to convince the body and the cells that life is not an emergency and that it is okay to burn that stored fat and release toxins. Instead of fasting you can do a kitchari cleanse for resetting the system, eating three complete protein meals of kitchari a day, so there is no starvation response whatsoever. Ayurveda helps us understand there are elemental forces that are at work in nature, in our bodies, and in our minds. There are three constitutional types in Ayurveda, called doshas: vata, pitta and kapha. To put it far too simply, vata is air, pitta is fire and kapha is water. Ayurvedic medicine focuses on treating and balancing the elemental forces that are too high or low in the body, thus creating imbalance and disease in the body. 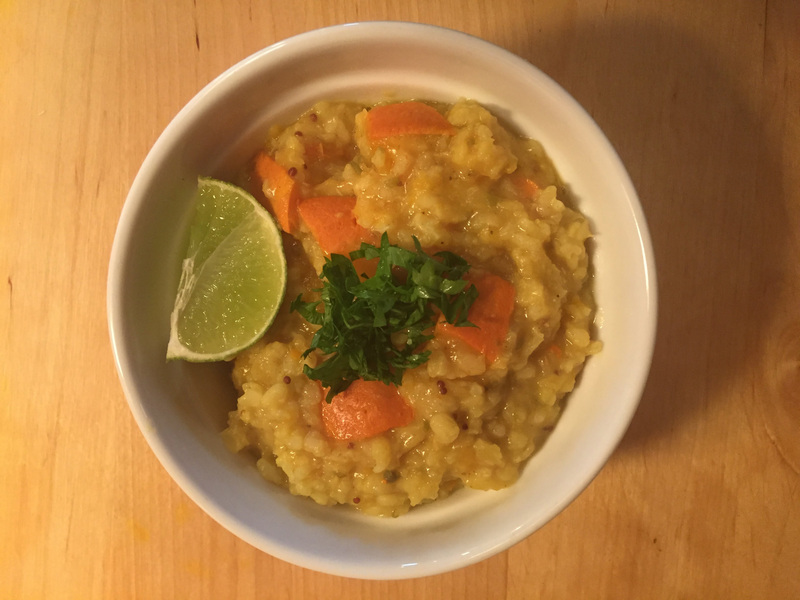 Besides being alkalizing and nourishing for our gut, Kitchari is a food that balances all the different elements in our body. 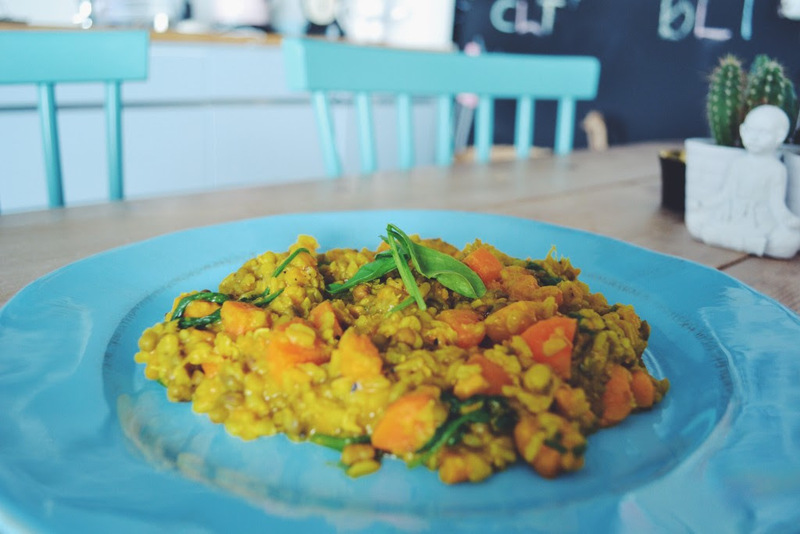 Kitchari provides nourishment in the form of a complete protein that will keep the blood sugars stable during a cleanse. Otherwise, ironically, the body may react to the cleanse as a fat-storing emergency! Why is Kitchari a Perfect & Complete Protein Food? There are 20 amino acids that combine with one another to make the proteins the body needs. Ten of them, the body can synthesize on its own. The other ten, called essential amino acids, the body does not make, meaning we must get it from our foods. Rice, like most grains, is very low in the amino acid lysine. As a result, if you live on grains alone, you will likely become protein deficient. Legumes and lentils, on the other hand, have lots of lysine, but they are generally low in methionine, tryptophan and cystine. But fortunately, grains are high in these three amino acids. For cultures that have subsisted on a plant-based diet for thousands of years, this marriage of rice and beans in kitchari provides the ten essential amino acids, making their diet nutritionally sustainable. Cook this until beans and rice merge and are practically one. Feel the love and nourishment in it. If you cook on a higher heat like I do cause my stove here won’t go lower, you can do it in 20 -30 minutes. Start heating ghee or olive oil in a large saucepan. Separately. Add the spice mixture to your pot of kitchari, stir well, and depending on how cooked it is you can continue cooking for another couple of minutes so that it absorbs the spices more. Serve with lime or mango pickle on the side for flavor or sometimes I cook the pickle in. Reheating leftovers in a frying pan makes it even yummier as you get more of a roasted toasty flavor. *A note on kitchari for cleansing: During a cleanse,the kitchari should be made with less or no ghee. Because ghee is a fat, it will slow the shift into fat metabolism. The less ghee we use, the deeper the cleanse. Outside of cleansing, as part of a regular diet, it is important and very nourishing to use ghee.You can make kitchari for yourself when you are sick, when you are sad, when you are cleansing, or for your friends, kids or a loved one when they are under the weather or when you come back from a long trip, when you need to regain your strength or any time you want to comfort yourself from the inside out. You will changed the acidity in your gut and mind to alkaline and friendly and pretty soon even your cravings will turn from acidic and toxic to alkaline and healthy. The golden brilliance of the sun is shimmering on the ocean waves and a balmy breeze caresses my cheeks. The waves crash against on the rocks providing a steady rhythm and pulse. The ebb and flow of life is so miraculous and I am so grateful for this present moment . What are you grateful for?